Do you ever have those times where you think "we'll, I'm just sitting here on my couch and the Netflix instant streaming queue is a little subpar right now… I should probably write a blog post." You keep thinking this over and over but alas, no blog post. Story of my life right now. I think in the time I thought I wanted to write a blog post I: watched some movies of questionable quality, ate a bowl of popcorn, did my laundry and cooked a whole bunch of things but failed to take photographs of them. Though I have been catching up on emails and planning a camping trip like my life depends on it. I mean, it kind of does but really I'm just procrastinating. Remember above how I mentioned I've been cooking a lot but failing to take photos? I would like to blame 4 of my best girlfriends, but in reality I continually forget to bring my camera to Tuesday night girl's dinner. That's right, every Tuesday we gather at Katrina's house to drink wine and cook an (according to all her roommates) extravagantly gourmet meal. So far we have made roasted butternut salad with fried sage/goat cheese crostini; whole wheat pizza with caramelized onions, figs & goat cheese; pumpkin cashew coconut curry and last night this delicious fall vegetable galette. I can feel the disappointment and resentment from my parents from the other side of the country; they always urge me to post more "real food." I'll just set a goal for myself of, no matter what, no excuses, I will bring my camera to dinner next week. Until then, as an act of mid-20's rebellion, I will blog about cake. At least it's a small cake that I made for a boy on his birthday. I think you get negative good karma points if you hate on a birthday cake, especially one for a boy that you think is cute. Disregarding shame and karma points, this cake was perfect for two people and I imagine it would work even better for a small gathering. The boy and I each had a small slice and I sent him off with the rest wrapped up and ready to be frozen. From what I understand, he ate a couple slices for breakfast the next day and polished it off not much later. While is he a guy and this doesn't mean much because it is common knowledge that all guys are human garbage disposals, this cake was pretty good. A simple spice cake with the addition of grated apples made the cake incredibly moist and light and the maple goat buttercream, as usual, provided an interesting and complex tang. 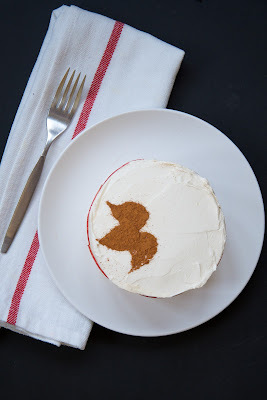 While you can obviously make this cake larger or divide the batter up into cupcake tins, the recipe below works perfectly for two layers of a 5 or 6 inch cake. I used the largest ramekins I had on hand, I'm not exactly sure how large they are. Preheat oven to 350 degrees and line bottom of ramekins or cake pans tin with parchment paper. Mix together flour, baking soda, salt, cinnamon and allspice in a bowl and set aside. Using an electric mixer on high speed, beat Earth Balance and sugar together until pale and fluffy in a large mixing bowl, about 5 minutes. Continue beating on high speed and add vanilla and the egg, beating until combined. Beat in grated apple, and trust me when I say the mixture is supposed to look a little weird and curdled. It's just the addition of the extra moisture from the apples mixing with the fats. With your mixer on low speed, gradually add flour mixture until just combined. Spoon mixture into ramekins, filling until they are approximately ¾ full. Bake in the oven for 30 mins, or until cakes are cooked through (test with a skewer). Depending on your oven and if you use a cake pan or not, this may take a bit longer. Remove from the oven and cool in pan for 5 minutes and cool completely on wire rack. Beat goat butter until fluffy. Slowly beat in powdered sugar a few tablespoons at a time. Halfway through adding powdered sugar, beat in maple syrup and extracts. This sounds intriguing and utterly amazing and I love the decoration you've shown us in your pictures, its that kind of flair that I envy! This cake sounds totally delicious! I love the goat's milk butter cream idea! I know how you feel with the whole sitting on the couch in front of Netflix, trying to work up the motivation to do anything else. Juls - Try out a mandolin - it has become my new best friend! Elise - Oh I know... I watch some movies (for HOURS) and all I can think is "...how did these make it into theaters?" 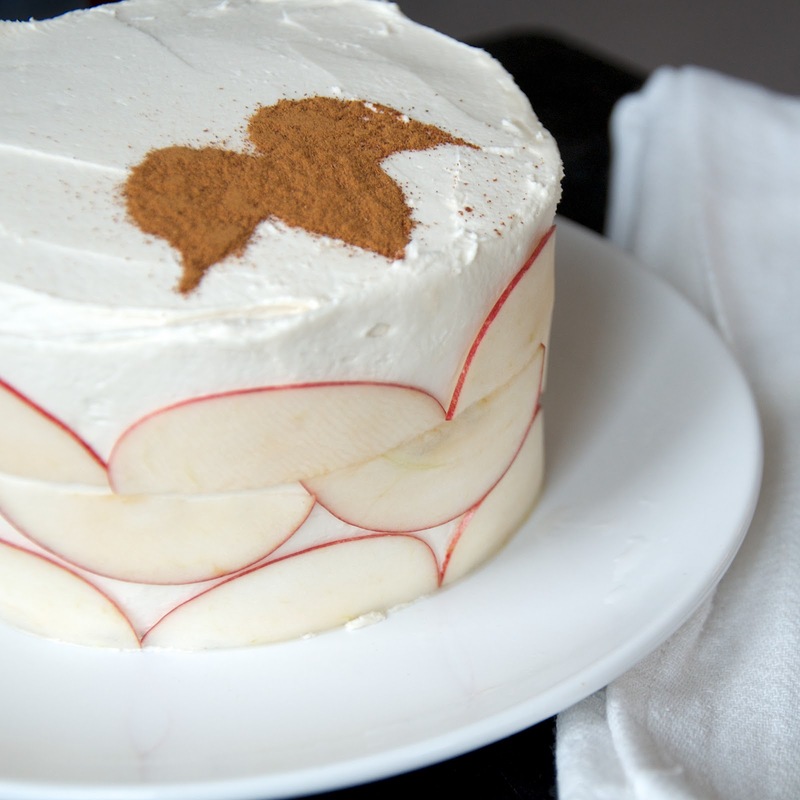 What a neat way to decorate the border of your cake with apple slices!